"Few dwelt in this cold realm of fear, where the wintry sun shone but briefly. Those who ruled here reigned from high-towered keeps of cyclopean stone. As for the common folk, a few miserable, terror-haunted serfs in clusters of dilapidated hovels eked out a drab life from the barren soil." -- L. Sprague de Camp: "The Witch of the Mists"
The first of the aboriginal Hyborian tribes to discover the use of stone in building, the Hyperboreans abandoned a primitive, nomadic way of life to settle in huge walled dwellings of stone, consequently founding the very first, but most isolated, of the Hyborian kingdoms. The citadels of Hyperborea are impressive even by Hyborian standards. They are made from mortarless stones carefully fitted together and dressed smooth to give no foothold for a climber. The walls are turreted and crenellated, fifty feet high and twenty paces thick, giving the fortresses a squat appearance. Windows and arrow-slits are set into the walls, too high to be entered, but low enough to allow effective defense. The ironwood gates are protected by iron portcullises and decorated with protective runes formed by patterns of iron nails. The western boundary of Hyperborea with Asgard was the River of Death Ice, having its source in the Eiglophian Mountains. This stream is shallow, clogged by glacial debris. Since it is also frozen throughout the long winters, it provids an ineffectual barrier against invading Aesir. The land of Hyperborea is wild and mountainous, gloomy and damp, its main pass ominously named Skull Gate. The people are pale-skinned, extremely tall and gaunt, with white hair and cat-green eyes. Many are as tall as seven feet. They are a superstitious lot who live as serfs in huts and hovels beyond the stone walls where they eke out meager livings from gardening the stubborn soil and herding small numbers of shaggy cattle and reindeer. Hyperborea is ruled by the White Hand - a coven of sorcerers not unlike the Black Ring of Stygia or the Scarlet Circle of Khitai. 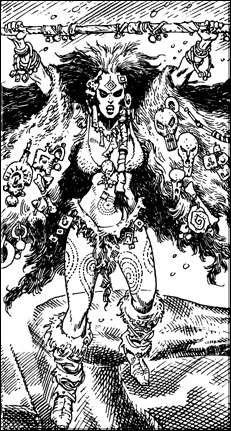 The White Hand "Witchmen" are the priests and priestesses of Louhi, the ever-reincarnating goddess of the Hyperboreans, as well as accomplished sorcerers. Their magic focuses around the cold of their land and control of the dead. Hyperborean sorcerers are highly prized in the northern wilds, but they are little respected in Hyborian lands. Hyperborea also hosts several bands of hardy slave raiders who make repeated forays into Cimmeria to fill their slave pens. According to tales, Conan was taken captive by Hyperborean slave traders early in his youth. After the Age of Conan, Hyperborea was conquered by Hyrkanians who galloped around the frozen tundra north of the Vilayet Sea.